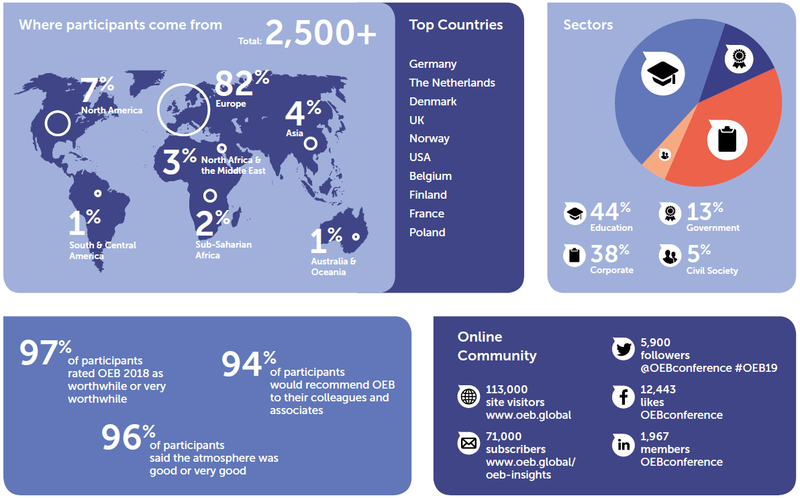 OEB Global has pushed boundaries, challenged preconceptions and catalysed new ideas for shaping the future of digital learning for 24 years. The event has a unique, cross-sector focus, fostering exchange between the corporate, education and public service sectors. This includes participants from multinational companies to SMEs, from higher education and research institutions to schools, from ministries to local authorities and from global IGOs to local NGOs. The conversations we are having about labour market infrastructures and data is remarkable and unique. OEB is the premier international conference to learn about learning and the cutting edge of educational tools and materials available. I could not think of a better place to be. The conference provided our team members with a great opportunity to reinforce our partnerships with colleagues from all over Europe and work together on upcoming projects. I think OEB is an incredible conference; it really brings together everybody working in this domain of digital education - people doing research, building tools, teachers, small companies, big companies. It's a fabulous meeting ground. I've been impressed by the number of companies here and the startup vibe. It's interesting to think where it's going to take us. I think that the discussions that are happening here are the right kind of conversations, with the right kind of people. There are quite a lot of disruptive speakers here. They hurt, sometimes, but really make you think about how we are going to change education. I am going home with solutions from OEB! OEB is special because the discussions are very sensible, grounded, rich. We are here because we believe to being exposed to innovations that are taking place all over the world and learning from the audience enables us to be better investors. Get the European perspective, get the business perspective and find out some leading technologies. I have been really impressed with the scope and the range of the content here. We find new ways of using technologies to improve our learning and development agenda. OEB is the best place really to get all the new ideas in e-learning. The Conference Venue, the 5* Hotel InterContinental Berlin, is centrally located at the Budapester Strasse 2, 10787 Berlin, Germany. The venue, the 5* Hotel InterContinental Berlin is centrally located at the Budapester Strasse 2, 10787 Berlin. Participants benefit from discounted accommodation rates at the venue and hotels in the vicinity. These rooms can be booked through a link, which will be provided once you register. Please note that we, the organisers, have been alerted to the fact that fraudulent hotel and travel agencies may solicit speakers and exhibitors of international conferences and exhibitions to sell non-existing rooms. Any calls or e-mails from companies offering these services are scams - and are in no way associated or endorsed by our organisation and event. We have not provided any contact details of OEB exhibitors, sponsors, speakers or participants to these companies and strongly warn you against booking hotel rooms through any company which claims to be associated with the event. With two city airports and Europe’s largest central train station, Berlin is easily and affordably accessed and has direct flight connections with more than 115 European airports. The conference venue lies 20 minutes from Tegel airport and 40 minutes from Schönefeld airport. Find information on the airports of Berlin here. Berlin has an extensive network of buses, underground lines (U-Bahn), urban railway lines (S-Bahn) and tramways (Tram). Berlin Hauptbahnhof (train station) and Zoologischer Garten (train and metro station) can be reached in about 15 minutes. Find public transport schedules here. Taxi Fares are paid according to the taximeter within the city and start at €4,00 for a short trip. Use the Uber or MyTaxi App, or call one of the taxi services: TaxiFunk Berlin 0049.30443322 or Funk Taxi Berlin 0049.30261026. The insider tip for economical transportation in Berlin is the Berlin WelcomeCard. Not only does it offer a public transport ticket for unlimited travel on 2, 3 or 5 days but also great savings of up to 50% on over 140 tourist attractions and cultural highlights.